T-ara’s Eunjung enjoyed her popularity in Thailand once again. After receiving a lead role in Thailand movie Microlove and becoming a hot topic, Eunjung flew to Bangkok once again on January 16th. The purpose of her revisit was to film additional scenes for the Thai movie and as well attend a press conference. A huge crowd of fans went to receive Eunjung at the Bangkok airport even though she arrived after midnight. The dozens of media personnels swarmed around Eunjung during the press conference for Microlove demonstrated her popularity very well. 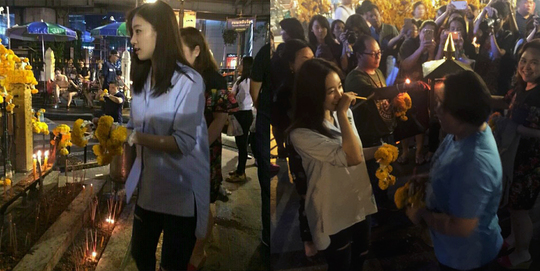 Eunjung also visited the Bangkok Erawan Shrine, a place where many tourists and famous celebrities from various countries make wishes and pray. She visited the shrine early in the morning without prior notice but there were still hundreds of fans who somehow knew and huddled at the back door to see her. In Microlove, Eunjung plays the role of Minji, the daughter of the president of a Korean software company, an elite employee and the female lead. daebak, thanks thai queen’s take care well and show support to eunjung.